We’re just about halfway through the FCS football season, and the playoff bracket picture just got a heck of a lot cloudier. The prohibitive favorite in the CAA, James Madison, lost their first game since forever – at home! – against Elon. Weber State, in control of their Big Sky destiny, lost a head-scratcher to inconsistent Northern Arizona, 14-13. And South Dakota State came within a whisker of losing a Missouri Valley conference game – to bottom-dweller Indiana State. What has changed, and what, like Jacksonville State demolishing OVC competition, remains the same week after week? The field for the FCS Playoffs is determined at the conclusion of the FCS regular season, which is the Sunday before Thanksgiving. There are 10 conferences that get autobids to the playoffs, the Big Sky, Big South, CAA, Northeast, Missouri Valley, Ohio Valley, Patriot League, Pioneer Football League, Southern, and Southland Conferences. A third, the Ivy League, chooses to not send its members to the FCS playoffs. Big Sky: With Weber State’s loss this week, steady Eastern Washington has a golden chance to knock the Wildcats out of the Big Sky conference race if they can poach a win at Weber this weekend. Idaho State, interestingly, looms, and if they can keep winning, they could challenge for the Big Sky title. Unfortunately, the Bengals and Eagles don’ t play each other in the regular season. Big South: Hard to see who can beat Kennesaw State in the Big South, though it should be noted Campbell is 5-1 and might make a surprising run at the title. 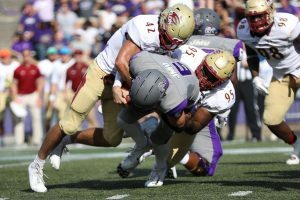 Colonial Athletic Association: With James Madison’s loss, do I have to – gasp – analyze the CAA title race? Four teams currently are at 2-0 in the division, Maine, Rhode Island, Towson and surprising Elon. The Phoenix get both Rhode Island and Towson at home, so Elon gets the edge for now. Missouri Valley: North Dakota State. They continue to impress, this week with an impressive 56-31 win over Northern Iowa. Northeast: Still thinking that Sacred Heart has the slightest of edge as our autobid winner so far, despite a loss last week to Penn of the Ivy League. Ohio Valley: Jacksonville State is still written in Sharpie. Their latest victim was EKU, who got demolished 56-7. Patriot League: The Colgate defense continues to be one of the toughest in all of FCS, after dispatching of Bucknell 27-3 this weekend. It’s becoming increasingly more difficult to visualize what Patriot League team could beat them. Pioneer: San Diego continues to roll. Last week they beat Morehead State 51-34. Southern: Wofford is still my pick to win the SoCon after surviving a tough test against Chattanooga this week. Surprising East Tennessee State looms as a big SoCon matchup with title implications in a couple of weeks. Southland: McNeese State has a bye week this week upcoming, but if Incarnate Word can beat struggling Lamar this week, it will set up a battle between the Cowboys and Cardinals next week of teams that are undefeated in conference play. Falling out of the seeding conversation is Stony Brook and Weber State and entering the seeding conversation is Elon and Eastern Washington. If you thought Elon was going to win last weekend vs. James Madison, 1) you should be very proud of yourself and 2) please tell me five stocks I should short the next couple of months. The Phoenix, who have only kept winning and winning deservedly get into the seedings this week.